The snow has arrived, leaving parts of the world looking like a magical winter wonderland right out of a picture. What a beautiful time for a wedding! Although you may think that choices of winter flowers for weddings are limited at this time of the year, I assure you that is not the case. Although popular wedding flowers are always an option, winter offers the unique and exciting opportunity to incorporate holiday themes into your wedding. First off, I just want to say that you do not have to choose a holiday theme for your wedding flowers just because your wedding is taking place in winter. Lilies, roses, daisies, and orchids, for example, are available all through the year; so are many other flowers, although out of season flowers and exotic flowers may be more expensive during winter. You can always choose flowers and arrangements based on your favorite flowers, wedding colors, or on the meanings of flowers. That being said, I would like to focus on the special opportunities that a winter wedding presents. Eleven percent of the thirteen percent of weddings that take place in winter are Christmas weddings. Typically Christmas themed weddings feature popular Christmas flowers and greenery, or traditional colors of red, variations of burgundy, ivory, and green. Poinsettias, amaryllises, and paperwhites are some winter wedding flowers in season. Baby’s breath, tulips, and lilies in shades of red and white are also great choices for Christmas wedding flowers. For those wanting more exotic flowers, take a look at hellebores, green and white orchids, and anemones. Pair these Christmas flowers with evergreen foliage such as holly or fragrant balsam fir. For those of you that follow my blog, you know how fond I am of berries and seed pods; winter is the perfect time to use pine cones and red berries like holly berries in your bouquets and centerpieces. Consider using wreaths of the previously discussed flowers and foliage as table pieces to surround berry bedecked luminaries, or small potted Christmas trees. Stunning or special Christmas ornaments can even be added to the floral arrangements. The possibilities really are endless when you have the chance to use these winter wedding flowers in season! Some couples choose all white flowers for their winter wedding flower arrangements to create the ambiance of a winter wonderland. There are a wide variety of well-known flowers like roses, lilies, and baby’s breath that are available in white, but let’s talk about some of the lesser known flowers. White hydrangeas bring to mind snowballs with their round, ball shape, and they also fill a bouquet well, which means you end up using less flowers, which in turn means you save money. Stephanotis is a small, fragrant jasmine like flower that can be wired into any shape. Pure white orchids in cascade bouquets are a knock out. 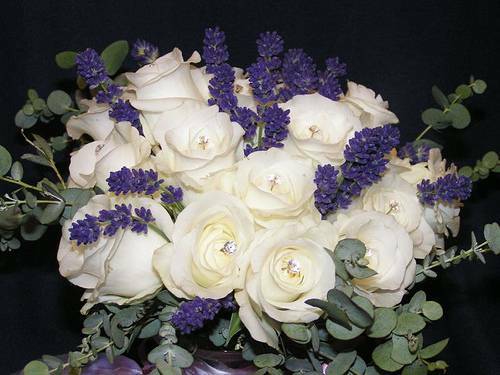 White cabbage roses and snowball chrysanthemums are more rounded flowers that mimic snowballs. Of course, gardenias are a perennial favorite. Even foliage can be white if you use lamb’s ear or dusty miller. Incorporating pearls, sparkling brooches or crystal elements reminiscent of ice into your bouquets and centerpieces is absolutely breathtaking. Sparkling white snowflakes work well too. Glass trays of live blooming paper whites or white amaryllis in rocks or marbles used as table pieces are great for the nature loving couple. White flowers symbolize purity and they also shine in a candlelight wedding ceremony. Purple and blue flowers with accents of green and white are ideal for the contemporary wedding, especially when paired with shimmery and metallic accessories like brooches, snowflakes, and ornaments. These colors remind us of the cool beauty of winter. Freesia, iris, statice, and green and white orchids are just a few winter flowers for weddings that feature these stunning colors. Blue hydrangea is another good choice; remember, many flowers like carnations and statice can by dyed about any color you please. Spring green foliage really makes these colors pop. Consider using unusual foliage such as green amaranth for a cascading wedding bouquet. Using just a few blue, purple, or green flowers in a white bouquet works well too, or add shimmery blue or purple ribbon or ornaments into your floral pieces. Fur and feathers incorporated into wedding flowers are popular right now too. The opportunities for winter wedding flower arrangements are not limited, but endless, as you can see. I believe that winter weddings offer special opportunities that other seasons do not. There are so many excellent and unusual choices for flowers that it is impossible to list them all; talk to your florist about the atmosphere you are trying to create. Us florists are full of experience and have a vast knowledge of flowers. Make sure you take swatches of the fabric of your bridesmaid’s dresses and wedding dress to match up with the right shade of flower; there are different shades of every color, even white, and you don’t want your dresses to clash with your flowers. With these tips and ideas, your wedding will reflect the magic of the holiday season.